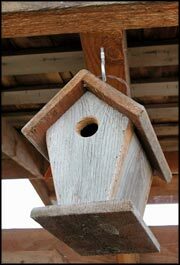 A bird house is a wonderful way to attract birds to your yard and garden. There are many considerations when it comes to choosing what type of bird house to go with. First of all, you will need to decide what types of birds you want to attract. Studies have shown that approximately 30 species of birds will use a bird house. When you have decided what type of birds you want to attract, do some research on their needs. What is required in their habitat? What will attract them? Does a feeder need to be nearby? How high should the birdhouse be placed? Should the birdhouse be near trees, or perhaps in a tree? Be sure to place the feeder in an area where the birds will be protected from predators and where the crosswinds will not be blowing into it. Have it in an area where it does get some sun. Once you have decided what types of birds you want to attract and where it will be placed, it is time to look for a birdhouse that will fit those needs.